SINGAPORE - Singapore was the fourth most-visited city in the world last year and is tipped to become No. 3 by 2025, according to Euromonitor's latest ranking of the the top 100 tourist destinations. 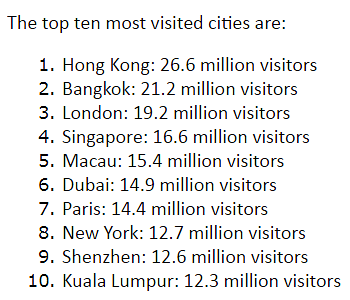 Hong Kong took top spot with 26.6 million visitors, followed by Bangkok with 21.2 million and London with 19.2 million. Then comes Singapore with 16.6 million visitors to the island. It beat other heavyweights such as New York (12.7 million visitors), Paris (14.4 million) and Dubai (14.9 million). Market research firm Euromonitor predicts Singapore will overtake London to third place by 2025, "giving the podium fully to Asia". Wouter Geerts, senior travel analyst at Euromonitor International, said the Asia Pacific is the "standout region driving change in travel", and expects the region to continue growing in the coming decade. The region pulled in 26 million visitors in the previous year - a number predicted to swell to 44 million by 2025. Euromonitor credited Asia's dominance to the "unstoppable" rise of Chinese outbound tourism. "This report highlights why some cities are performing better than others and how emerging trends are going to reshape the travel industry and disrupt the ranking up to 2025," said Mr Geerts. Thus, European cities on the whole performed badly in this year's ranking, hampered by the Eurozone and migrant crisis, as well as Brexit and terrorist attacks, according to Euromonitor. But some European destinations, particularly Greece, Italy and Spain, have profited from unrest in the Middle East and North Africa, it said. The United States was hit by "global unease" following Donald Trump's arrival in the White House, which makes future performance uncertain, said Euromonitor. If the US drops out of the NAFTA free trade pact and imposes a 35 per cent tariff on Mexican imports, followed by Mexican retaliation, the impact on that region's travel would be considerable, it said. In the worst case scenario, New York - the only US city in the top ten - might see a drop of as many as 300,000 visitors this year, the report added. Underlining the lure of the metropolis, a total of 1.2 billion trips were taken worldwide last year, with visits to the top 100 cities accounting for almost half, at 46 per cent, said Euromonitor.